This report is an account of my personal vacation. I suspect that's why this report has been the most difficult to put on paper. Previous Wimco business has brought me to Italy, St. Martin, Barbados and, of course, St. Barts. Each trip has required a journal of my travels, but my accounts were more from a reporter's point of view rather than that of a participant. This story begins back in November 2002. 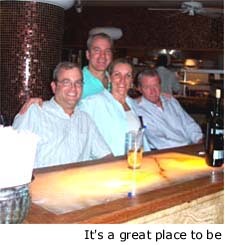 My colleagues Bethany, Glenn, Severine and I were sent to Barbados for a villa and hotel inspection. On the first day Severine and I inspected several hotels on the West coast, most notably Sandy Lane and the Coral Reef Club. The following 3 days were spent with Bethany and Glenn touring villas along the west coast and up in Sandy Lane Estates. There were so many amazing villas to describe to you, but that is not what this story is about. On our final day of touring villas we visited a very pretty two-bedroom villa located directly on the beach called Senderlea. What was different about Senderlea, aside from all the other gorgeous villas on Barbados was that I imagined myself here on vacation. I asked our host how much Senderlea rented for in low season. Our host stated that it was $3,200 and it included a cook and a housekeeper. I immediately got on my cell phone and called my fiancée Anne-Marie (yes, that Anne-Marie, my colleague). I said "I found it. I found the perfect villa for our next vacation." Alas, Barbados would wait two more years as it was first time to "meet the parents" in Europe. When it came time to plan our vacation to Barbados Villa Senderlea (BS SND) wasn't available for our preferred dates. Oh the dismay! So we asked our colleague and Barbados specialist, Glenn, for her recommendations. We had three requirements. The villa had to be on the beach, it had to have a pool, and as we were traveling with friends, it had to have at least three bedrooms. 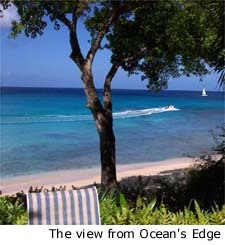 Glenn recommended one of the Barbados villas at Merlin Bay (RL MER). Beginning April 15th $3,000 gets you three bedrooms on the beach with two pools, a housekeeper and a cook. Over a glass of wine with our friends we selected Ocean's Edge at Merlin Bay. After the second glass of wine, we also collectively agreed that seven nights wasn't long enough for a proper vacation. Later we learned that Ocean's Edge wasn't available for an extended stay. Again we asked Glenn for her recommendations. Glenn suggested that we begin our vacation at Port St. Charles and then move to Ocean's Edge at Merlin Bay. Okay, it's settled. We arrived mid-afternoon at Grantly Adams International Airport. I was very pleased with not only the physical improvements they had made to the airport since my last visit, but more importantly the improved attitudes of the airport personnel. Enduring a major renovation at an International airport is sure to fray even a Bajan's gracious demeanor? After grabbing a bottle of Mt. Gay in the duty free we walked outside to meet our transfer. Our transfer brought us through the heartland of what I find to be, one or the most interesting countrysides in the Caribbean. One might ask, what is so interesting about sugar cane? Well, for one thing there are oil derricks spotted throughout the cane fields that supply nearly 50% of the islands needs. Forty minutes later we were checking into one of the villas at Port St. Charles (Villa AA 3BV), which is approximately 10 minutes north of Holetown. 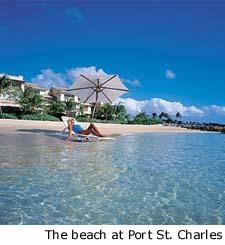 Port St. Charles is a relatively new villa style hotel that I would describe as apartment style – very nice apartments. Each apartment is individually owned. Apartments are uniquely appointed for individual owners willing to share the privacy of their lifestyle with you. Hotel amenities include a restaurant, bars, health club, tennis courts and a sizable marina facility. While all the apartments at Port St. Charles are furnished in the highest standard, you should insist on a beachfront apartment. The beach at Port St. Charles is perfect. We stayed in a three-bedroom beachfront apartment overlooking the marina. Our apartment was beautifully decorated, but when not at the beach, we spent most of our time on the enormous veranda. There we were on the beach our first afternoon, in our swimsuits enjoying a late afternoon swim, a rum punch and ten whole days on Barbados in front of us. It's a great place to be. That evening we dined at my favorite restaurant on Barbados. 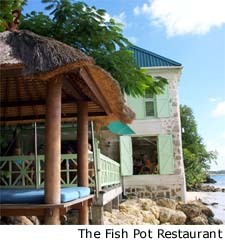 Discovered from my previous visit to Barbados, the Fish Pot is located directly on the water a mile up the road from Port St. Charles in Little Good Harbor. We enjoyed grilled local fish and a nice bottle of Domaine Ott, while delighting in the sounds of water slapping against the rocks beneath us imagining the fun we were about to have.